1. The device is suitable for children over 8 years old and adults, children must be accompanied and monitored by adult when using the pen. 2. To avoid clogging the filament feeder inside, please cut the ending tip portion of the filament where you stop, because the melted part need to be cut off. Incredible Fun in Creating. 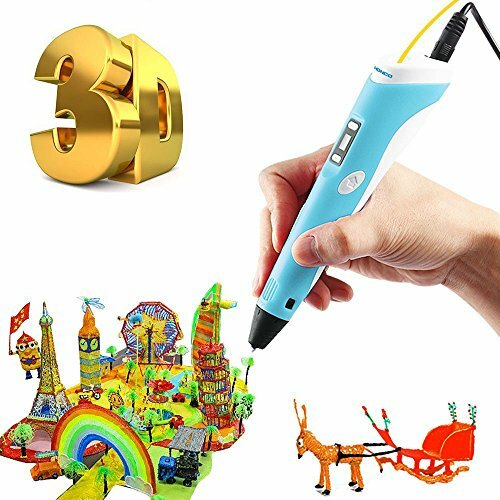 Unleashes your dream and your imagination with i-CHONY 3D printing pen. Perfect for both children and adults,Unleash your Creative Thinking! Fly your Imagination! Bring your art idea into Reality! Have More Fun!Everything is not lack only your imagination! Scald-preventing for your hands. Ceramic-made outer jacket avoids high temperature. Melted plastic cools down very fast to make the whole process safe. 62g otal weight is so light easy to hold on perfect. Not only beautiful,but also practical :it has enough features to keep them happy for a long time, and as long as they are operated under proper supervision. Best gift for children to create their art inspiration with drawing artistic works. If you have any question with first use of this product, please always contact us first anytime before leaving feedback/review,we will strive to fix the issue to your full satisfaction.